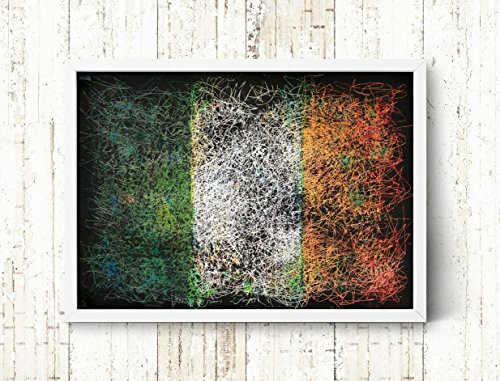 This is an original, 100% handmade, abstract, light textured flag painting on paper. This painting was created using gouache paints, coloured pencils and ink. The painting is unique, expressively textured, no two are ever the same, and you can only get them here! It will look great on your wall! ** All artwork is custom made by hand. Please note that this is a "made-to-order" artwork. Please allow 3-10 business days for it to ship. ** FRAME IS NOT INCLUDED** ** IMPORTANT - Please keep in mind that every computer monitor displays color a bit differently, so what you see on your computer screen could vary a little bit from the artworks you receive. SHIPPING INFO: The artwork is carefully packaged in a rigid, sturdy reinforced tube to prevent damage during shipping. If you have any questions about this product by ArtForLoft, contact us by completing and submitting the form below. If you are looking for a specif part number, please include it with your message.